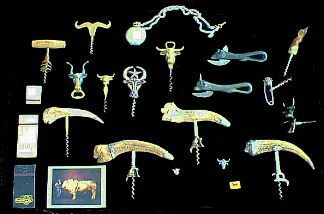 I have had the good fortune of finding a number of bull corkscrews (and other bull things) over the years. The generosity of several collectors has helped build the collection. 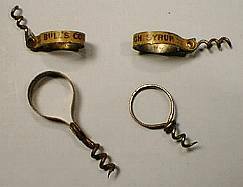 Here are both flat band and wire corkscrews advertising Bull's Cough Syrup. 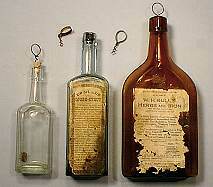 The first and second bottles are Dr. Bull's Cough Syrup from Baltimore, Maryland. The Bulls at top center are wall mounted bottle openers. 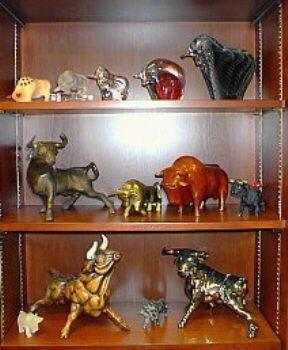 At bottom left and right are Bulls with bottle openers in the base. The brass bull with the folding tail is cheaply made and turns up frequently. The charging Bull at bottom center was a gift from Don Minzemayer. 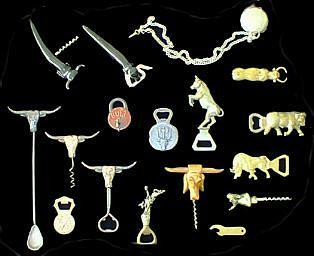 A horn handle corkscrew and cap lifter are at top left. A bar set at bottom left was a gift from Dean Walters. The wood water buffalo bull right of bottom center was a gift from JoeParadi. The Bull lock left of center was spotted by webfriend Philly on ebay. The bull below the bull engraved pocket watch appears to have been run over by a truck and was a gift from Don Morway. The horns at top left are a gift from Wolfgang Handel. Four bulls with horn handles and silver finishings add some real class to the collection. The German spring barrel is marked Bull Brewing Company and was designed by Joe Balaban. Bull boot jacks. 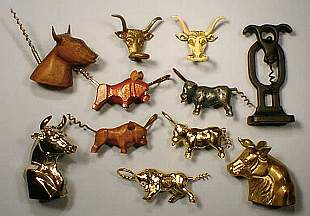 A bull watch fob from the Bull restaurant in Bridgeport, Connecticut (1890). A bull tie clasp. And a bull something you don't want to step in gifted to me by Don Morway.